The beautiful colonial house that sits on North Street was ominously called “The Shadows”. J. E. Norton Shaw and his wife, Helen Sherman Shaw happily lived in the house since their 1909 marriage. In that time they enjoyed bird watching, plays, traveling and many other activities. But on Thanksgiving weekend, 1926 the house would witness a terrible tragedy and the quiet life they lived would be shattered. Helen Sherman was born in New Bedford on October 28, 1880 to William Sherman and Rosa Cook. Before marrying, she attended Brown University and graduated in 1902. While at Brown she helped form the Komains, a theater club for women. The only option for women actors at Brown at that time was a sorority that performed Shakespeare plays. The Komains would produce their own plays and the women would play both the female and male parts of the play. After leaving Brown, Helen Sherman would go on to teach school in places like Quincy, Grafton, and Mattapoisett. It is perhaps during her time teaching in Mattapoisett that she met J. E. Norton Shaw, a lawyer who lived in town. James Ebenezer Norton Shaw was born in Mattapoisett on February 7, 1876 to Bruce Freeman Shaw and Eliza Angelia Cook. Norton, as he was called, was raised in the town almshouse on Aucoot Road, his father being the keeper of the almshouse. Norton attended school in Mattapoisett and prepared for college at Tabor Academy in Marion where he graduated second in his class. At Tabor he was described as being “satisfactory in deportment and morals”. Though he failed an earlier attempt at his preliminary exams, his work was faithful and completed out of his sense of duty. His family “stands well” in Mattapoisett and he was influenced to pursue a liberal education. After studying at Tabor he enrolled at Harvard University. At Harvard Shaw played football making the varsity team his freshman year. He was described as a tower of strength playing right guard, weighing in at 210 lbs. at 5’11”. He was well liked at Harvard, involved in several student organizations and was chosen a member of the class committee. One teammate later said of him he was “a splendid fellow in every way”. After graduating from the college in 1898, Shaw went on to the Harvard Law School where he earned a law degree in 1901. From there he opened up a practice in New Bedford and had an office located at the Masonic Building. About eight months before marrying Helen, Shaw purchased “The Shadows” from his father. The Shaw’s lived a quite life and had no children. While they lived at the Shadows, Mr. Shaw would “motor to and from” his office seven miles away. They spent their leisure time studying birds and reporting their findings to groups and publications dedicated to protecting birds such as Bird-Lore. They also took part in yacht racing, farming and “motor cruising” throughout New England. They traveled to Maine and Canada for canoeing trips and to explore forests. Helen particularly enjoyed watching sports including boxing matches in New Bedford. A woman at a boxing match drew much notice in those days but she apparently didn’t mind. Mr. Shaw was also very much engaged in his work as an attorney in general practice at the Masonic Building in New Bedford. In 1926, he was appointed co-executor of the will of George Russell of Acushnet. Russell had bequeathed a large portion of his estate to Acushnet worth around $140,000. The money was to fund a new library, upkeep of the town’s cemeteries and for other projects. Russell, a Mayflower descent, taught school in Acushnet, Fairhaven and New Bedford for 22 years. He was once noted by the town of Acushnet for his success as a teacher due to his qualities of “firmness, patience and self possession”. After teaching, Russell went in to the banking business. In 1880, he married a woman named Abbie Pilling but by 1900 they had divorced having had no children. Russell had become lonely and had fallen for a much younger woman named Rebecca Maud. He was in his 60s while she was in her 20s. Apparently they had developed a friendly relationship. At some point he began to refer to her as his “sweetheart” and proposed. She declined his offer despite the urging of her friends to marry him. She later married Wallace Holmes and Russell did not speak to her for a year. They were soon on good terms but Russell’s infatuation for her did not end. When she became pregnant he offered her $40,000 to name the child after him if it was a boy. She accepted his offer and named the baby boy after him. But the baby did not live and Russell died soon after. Before Russell died, he had hired J. E. Norton Shaw to be the executor of his will. Russell called a meeting with Mrs. Holmes and Mr. Shaw and instructed the attorney to invest the $40,000 in bonds for Mrs. Holmes. At least that is the story Mrs. Holmes told in court. Rebecca Holmes and J. E. Norton Shaw were to attend a hearing on November 29, 1926 due to objections raised by the town of Acushnet. The town had questioned the nearly $40,000 paid to Mrs. Holmes and two payments made to Mr. Shaw of $2,200 and $1,700. The money had come from Mr. Russell’s estate. The hearing would not take place. On Thanksgiving, Mr. Shaw spent the day with his friends and family in a cheerful mood. The court hearing, his friends would later say, didn’t seem to bother him. The Friday after Thanksgiving, Shaw went to his office as usual and left at the end of the day, leaving the papers related to the estate and court hearing on his desk in preparation for Monday’s hearing. He came home around 3:30 and changed in to some old clothes and grabbed his shotgun. He told his housekeeper, Catherine Sherman, he saw a rat in the yard on the way in and he was going out to shoot it. At about 4:45 he came back in the house and said the rat had got away. Shaw then went up stairs where his wife was getting dressed for her evening walk. A moment later a shot rang out. “My God, I’ve shot my wife! The gun went off! Call Dr. Tilden, quick!” he yelled down to the housekeeper. Ms. Sherman ran to the phone to call Dr. Tilden who said he would be right over. Putting down the phone she turned to hurry up the stairs when she heard the second shot. Headstone of J. E. Norton and Helen Shaw, Cushing Cemetery, Mattapoisett, Mass. After Dr. Tilden arrived he called for Dr. Raymond Baxter of Marion a medical examiner. They examined the Shaw’s as they lie dead in the bedroom; Mrs. Shaw with a gunshot wound to the chin and neck, Mr. Shaw with a gunshot wound to the head. Mr. Shaw’s aged mother, who lived across the street from the Shadows, was unaware of the tragic events that had taken place. For days afterward no one had the heart to break the bad news. Initially, Dr. Baxter ruled the incident an accidental homicide and suicide. A week later while the Shaw’s bodies lay in their home for the funeral services, the District Attorney Winfield M. Wilbar, stated that Dr. Baxter exceeded his authority in the ruling. Later a private inquest was held and the judge later agreed with Dr. Baxter’s findings. However, Shaw and Holmes were later charged with conspiracy to deplete the Russell estate. Judge Mayhew R. Hitch found that Russell was incompetent of the time he gave Mrs. Holmes $40,000. She was charged with maladministration and Mr. Shaw was charged with fraud. Two years later the house was sold to Benjamin S. Blake of Weston, Mass. Today, the house is no longer known as the Shadows and the Shaws lie side by side in the quiet Cushing Cemetery as moss grows over their neglected headstone seemingly trying to hide the tragic history of the end of their lives. Sometime between 1861, when Butler issued his orders relating to escaped enslaved people, and 1863, when the Emancipation Proclamation went into effect, an enslaved man named William Scott began working as an assistant cook with the Third Regiment. William was .born into slavery around 1822 in Virginia. He was enslaved in Hicksford by a man named Nathaniel Land. Later, William was sold to a man named George Gray of Windsor, North Carolina. While enslaved by George Gray, William became involved with an enslaved woman named Priscilla Collins. Priscilla had been married to another enslaved man and had children. While slave marriages held no legal standing under local or federal law, enslaved humans married out of tradition, the belief in the importance of family and, of course, love. However, slave marriages could be broken up at anytime. A slave owner could decide to sell an enslaved human who was married while the spouse stayed behind. Children of an enslaved couple could be sold as well. Families were often ripped apart to never see one another again. After James Allen died, Priscilla was sent to live with his son, Thomas. It is possible that at this point, Priscilla and her husband were separated or her husband died. Later, Priscilla and William would meet and they would marry. William evidently became popular in Mattapoisett and he made many friends. The whereabouts of Priscilla were either known by William or a group of people who befriended him in Mattapoisett and tracked Priscilla down. In 1868, she was brought north to be reunited with William. Home of William and Priscilla Scott on Mechanic Street, ca. 1900. Photo courtesy of Graeme Keir. Five years later, Priscilla would become sick and die. Her cause of death was listed as enlargement of her liver. She had survived slavery, become a free woman and lived to be around 80 years old. William was now living alone. Delia was living in New Bedford, possibly with a family as their servant. However, in 1889, she too became ill and died of a consumption related illness. William continued to live in his Mechanic Street home for the next couple of decades, working as a laborer and a gardner. In early November, 1912, he became ill. He was in his 90s and still working but time was taking its toll and his heart was failing. On December 12, 1912, William died at home. He was laid to rest in Cushing Cemetery, his headstone noting his origin as a slave. Nearby are the graves of Priscilla and Delia, forever reunited as a family. Early municipal record keeping in America consisted of recording town business along with life events of the town residents such as births, deaths and marriages. These records were often written down in numbered volumes or books. Book IV of Rochester town records include the births of the citizens of Rochester in the late 1700s and early 1800s. One particular entry records the dates of the births of the children of Lucinda and William Parlow, Jr. They had ten children from 1789 to 1812. The first child noted was Keziah born September 30, 1789. Aside from historical value, there is nothing remarkable about this entry of births and the many others like it. But in the fall of 1886 a reporter from the Boston Daily Globe was sent out to investigate the life of this child who was born during the first term of President George Washington. He arrived in Mattapoisett asking for directions to a house deep in the woods on the outskirts of town to conduct an interview. “Take the road toward Marion out to the Quaker Meeting House”, he was told by one of the locals knowing exactly who the reporter was looking for. Many people came to town to make this visit including Frances Cleveland, the wife of President Grover Cleveland. The reporter followed the directions, riding through the woods behind the Quaker Meeting House on present day Marion Road. He came to a clearing which stood a small cottage surrounded by large pines. He knocked on the door. When the door opened a small, elderly woman with snow-white hair greeted him. “Hitch your horse to the tree and come right in. I know what you want”, she ordered him. “You want to see the old lady that lives in the woods. I have lots of visitors… They think I’m crazy to live out here alone in the woods, but I tell ‘em that’s what keeps me well and healthy”. Perhaps she was right. Aunt Keziah, as she was known, was now 103 years old. She insisted that she was born September 30, 1783 not 1789. Keziah Parlow was born in Marion at the site of what became the Marion railroad station. By the time she was ten years old she was sent to live with a local preacher where she worked and received an education. 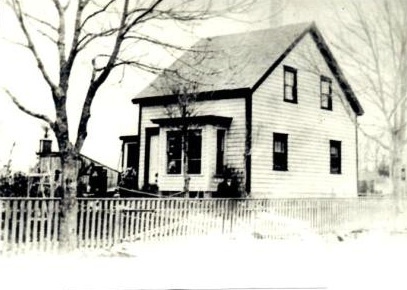 Around 1807 she traveled to Smith Mills in Dartmouth where she taught school. At some point she relocated back to the tri town area and in 1810 she married Richard Randall. Mr. Randall was a much older man, about 55 years old at the time of their marriage. In 1812 when war broke out, Mr. Randall volunteered to serve as a coast guard. He didn’t see any action and returned home. In 1815 he contracted yellow fever and died. The same Book IV that lists the birth of Keziah, lists the children born to Richard and Keziah Randall on the next page. It notes they had three children; Arethusa born in 1812, Roxalana born in 1814 and an unnamed daughter born in 1816. This daughter born in 1816 may have been Lucretia who died in a fire early in 1824. Keziah left the home for a little bit while the children stayed inside. It was suggested later that Lucretia’s clothing had caught fire, she panicked and ran around the room spreading the flames. When Keziah returned she found Lucretia severely burned and dying nearby a cradle that had, what was reported to be Keziah’s infant daughter. Keziah pulled the baby from the flames that were surrounding the cradle. The baby was most likely Matilda, who was born in April of 1822. Vital Records of Rochester, Mass does not note the father of Matilda but it may have been Ezra Read of Dartmouth. Ezra and Keziah filed an intention to marry in December of 1822 but apparently never married. 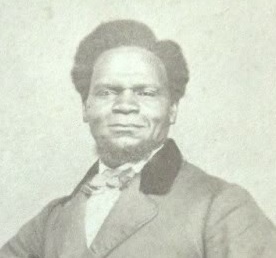 Keziah claimed to have a son who was living in Virginia by the 1880s. She kept a photograph of herself standing with him in front of her house along with photographs of her grandchildren hanging on her walls. Aunt Keziah managed to support her self and children over the years and put money away. By 1835 she moved to Mattapoisett to work for a man as his housekeeper. Not long after going to work for this man he passed away and willed his property to her. She lived in his old log home for a short time before having a new house built on the property around 1837. She would spend the next several decades in this home. She remained active working in her garden growing her own food and otherwise running her own farm. Being engaged in active out door work is what Aunt Keziah credited to her having lived a long life. She nursed her self when she was sick using herbal remedies, made her own root beer and made rugs for her house. Near the end of her life she noted that girls of the day did not learn any useful skills such as spinning and weaving. “Now they play the piano, go to school and get so lazy that they die early”. They eat too much sugar and “the o-so sweet stuff” and don’t know how to dress. “They wear a little mite of a plate on top of their head and go half naked” she said of Victorian era young women. “Girls were prettier then than they are now”, she added. Despite living alone in the woods, Aunt Keziah was not a hermit. She welcomed visitors from ‘Poisett as she referred to Mattapoisett. She made trips to see her daughter, Arethusa in Fall River and grandchildren in New Bedford and Brockton. In 1889 Aunt Keziah’s friends celebrated her 100th birthday with her. They took her to a picnic and gave her $100. Despite this generosity she was quietly disappointed. For her birthday she had been hoping for a headstone for her grave. She had a fear that when she died she would be buried in an unmarked grave. She had put away money so she could place a headstone on her husband’s grave at the First Parish Cemetery in Rochester, with the phrase “We shall meet again” inscribed on it. Later, summer residents in Mattapoisett would furnish Keziah with a headstone that was placed in Pine Island Cemetery. In the months before she passed away, she could be seen wandering the cemetery where she would visit her own grave and work on it, preparing for her final resting place. In the summer of 1892 she became very ill, was confined to bed and soon slipped in to unconsciousness. Not long before, Aunt Keziah’s grandchildren were visiting her Just before leaving as she lay in bed, one of them said, “I’m going home, Aunt Keziah”. Pointing upward, Aunt Keziah replied, “So am I”. Grave site of Keziah Randall, Pine Island Cemetery, Mattapoisett, Mass. The gravediggers worked hard digging through the cold February ground. The corpse had been buried for seven days during the dead of winter of 1841. Hopefully, the smell would not be as bad. Rumors had begun to circulate in the days after the death of Thomas Randall. His death had come “by unfair means,” it was said. Unfair, presumably meaning he was murdered. He was 43 years old and was eating dinner with his family when he fell back in his chair, began gasping for air and turned black in the face. He was known as an “intemperate man” and may have been drinking at the time. Before anyone could help him, if help was even attempted, he died. It had snowed about six inches on February 1, the day after his death. The Reverend Thomas Robbins noted he attended a funeral the next day of the “drinking man who had died suddenly.” He was buried at the “Mattapoisett Cemetery” after the funeral. Thomas Randall married Maribah Parlow on June 18, 1820 in Rochester. They had five children between 1821 and 1832, all girls. Perhaps it was because Mr. Randall was known as being a drunk and he had died suddenly with his family watching, people began to think his death was not an accident. The rumors persisted and soon several people demanded an investigation. The coroner asked a jury to order a disinterment of the body, and on February 9, several men went to the cemetery with shovels in hand to dig up the remains of Thomas Randall. The news had spread throughout New England. Newspapers in New Bedford, Boston, Salem, Northampton and Keene, New Hampshire would report on the grizzly post mortem exam. Digging up bodies was not a common thing in 19th century. Social beliefs of the time thought of the dead body of something to be protected. There were also many superstitions about corpses, such as the belief that the living needed to be protected from the dead. When the grave diggers made their way though the cold, icy ground and the several inches of snow that continued to fall during the past few days, they lifted the wooden coffin up and loaded it on to a wagon. The rotting corpse was carried through the streets of Mattapoisett to perhaps the office of one of the physicians in the village. Waiting to observe the dissection and exam of the corpse was the coroner, the jury and “several spectators.” Dr. A. S. Jones of Mattapoisett was assigned to perform the post mortem exam. This same Dr. Jones would be charged a few years later along with another local doctor and a medical student for robbing a grave of a corpse for the purpose of dissecting it. Dr. Jones went to work on the body of Mr. Randall while the onlookers observed in curious silence. Medical training at the time did not often include hands-on dissections of bodies. What one knew of anatomy was often learned through reading books and later while operating on living persons. Perhaps Dr. Jones took this opportunity to explore anatomy while performing the exam. Or perhaps he worked quickly because the corpse was already over a week old. While examining the air passage of the deceased, Dr. Jones was sure he discovered the cause of death. Either by reaching in the mouth or cutting open the throat, Dr. Jones produced what appeared to be a mass of flesh. Upon further examination and knowledge of the menu of his dinner the night of his death, it was discovered that the mass lodged in the deceased’s throat was a large piece of boiled pork weighing about an ounce and a half. The jury rendered a verdict of an accidental choking while eating. Any thoughts of an “unfair” death were quickly put to rest in Mattapoisett. Mr. Randall was returned to his grave where he has been, hopefully, at rest for the past 177 years. In 1902 the State Board of Charity delivered its annual report to the Massachusetts legislature. The report was not a positive one. It noted the large number of complaints about the state’s almshouses including overcrowding, dilapidated housing, squalid living conditions and vermin. The report indicated that the almshouse in Rochester was home to four people, one man and three women. It stated that the almshouse itself was “in very bad condition and beyond possibility of repair”. Rather than spend money to build a new almshouse and continue employing and supporting a keeper for the almshouse, Rochester decided to board out the inmates. One of those boarded out was 81 year old Jim Perkins. Mr. Perkins had been a lifelong resident of Rochester. He was born February 16, 1821 to John and Salome Sherman Perkins. He was the eldest of eight children and lived at home until at least 1850. Three years later his mother died of tuberculosis. It may have been around this time that Perkins left Rochester for Hartford, Conn where he learned to work with sharpening tools and became a skilled axeman. When he returned to Rochester he worked as a farm laborer and took jobs chopping wood whenever he had the chance. Before ending up in the Rochester almshouse, Perkins boarded with Andrew Haskell and his family who lived in Marion “on the road leading to Rochester”. Mr. Haskell noted that Perkins was “a little flighty and seemed to have a hobby for sharp instruments.” At some point Perkins had a collection of axes but sold them off after having “some trouble with a man he worked for” as Haskell explained it. But Mr. Haskell also described him as a “dandy in his younger days…There was no feller in these three towns that looked any finer when he fixed himself up for a party”. Perkins never married. It was rumored that he was engaged to be married twice but both times his fiancé died leaving him love sick. Perkins began collecting shaving razors after giving up his axe collection. He kept the razors in a chest at the Haskell’s. One time Perkins became ill at the Haskell’s and he mentioned his razor collection to the doctor treating him. While it is not clear what his illness was the doctor warned Haskell to hide the razors out of fear that Perkins could hurt himself or others with the razors. When Perkins moved to the almshouse he did not take the chest of razors with him. Instead they remained in a loft in a shed at the Haskell’s. He still kept in contact with his friends at the Haskell household and would spend time sharpening and polishing the razors. Before he would return to the almshouse he often replaced Mr. Haskell’s shaving razor with a fresh one from his trunk. He would clean and sharpen the old razor and “let it rest” in the trunk. When the almshouse closed Perkins was classified as being senile and became a ward of the state. He was moved to Bridgewater to the State Farm. While at Bridgewater he became sick and passed away on November 6, 1902. The cause of death was listed as dilation of the stomach. When news of Perkins’ death reached Rochester, the local gossip led to his collection of razors. Rochester selectmen decided to follow up on the gossip and investigate to see if Jim Perkins had left behind personal belongings of any value. At Andrew Haskell’s home the selectmen discovered that Perkins left behind two old chests. In a large chest they found stored several axe handles and hones, boxes of polish, soap and rags. Other items included two swallow tail coats from the early 1850s, left over no doubt from Perkins’ partying years. In a smaller chest the selectmen were astonished to find the shaving razors collected by Perkins—all 239 of them. The razors were in perfect condition, shined and polished. Many were newer razors but several others were stamped with the dates 1825 and 1830. Many had ivory or bone handles. Several of the blades were manufactured by well known manufactures in Sheffield, England such as blades produced by Frederick Reynolds. These blades found were known as Washington razors because of the full length etching of George Washington on the blade with the words “The Champion of Liberty”. Another Sheffield manufacture blades that were found included John Helffor who was noted to produce blades in the early 19th century with the words “made for the army” stamped on the blade. A blade made by William Graeves described as being from the “before the war period” was inscribed “I am good and will shave well”. Selectman Alden Roundsville took some of the blades to experts in Boston thinking Rochester could cash in on the find. The experts concluded that they had indeed made a valuable discovery and that Jim Perkins knew his razors. Rochester put the razors up for sale and Selectman Roundsville offered to give shaving demonstrations for people interested in purchasing razors. When he had no stubble to shave he would pluck hairs from his head to test the razor’s edge. However, his hair was already thinning and Mrs. Roundsville quickly put an end to the demonstrations. The razors were offered at $1 for new razors and 50 cents for older ones and they became very popular throughout town. The Boston Daily Globe reported that nearly three-fourth of the men in Rochester were bearded but in the dash to get a “Jim Perkins Razor” the town’s men were expected to be beardless before long. One hundred years ago this month the world reacted in horror as news of the sinking of the Titanic spread. The RMS Titanic was carrying 2,233 people traveling from Southampton in the United Kingdom to New York City. However, she was only carry enough life boats for 1,178 people. Anxious people at home with relatives on board held their breaths as news was telegraphed of reported survivors and confirmed losses. One such message was cut off in mid transmission leaving a fragmented name, “Mile…” At home the family of Francis Davis Millet held out hope that this name was Millet. When Civil War came to America, Frank enlisted at the age of 15 as a drummer boy and would also assist his father who was a surgeon during the war. When the war ended Frank enrolled at Harvard and graduated in 1869. For a time after that he wrote for several newspapers in Boston before entering the Royal Academy at Antwerp in Belgium where he quickly established himself as an artist winning recognition for his work. He traveled throughout Europe after he left Antwerp exploring and painting. He then returned to Boston where he assisted in decorating the Trinity Church. He was decorated during the war for his bravery and helping the wounded receiving several medals including the Romanian Iron Cross, the Russian Military Crosses of St. Stanislaus and of St. Anne and other medals. After the war he went to Paris where he painted and served as a member of the Fine Arts Jury of the Paris Exposition. While in Paris he wrote to friends that he had a “malady that is very contagious… it is the kind of malady that… the more it attacks the more he wants [it]”. The malady he wrote of was love and in the spring of 1879 he married Elizabeth Greeley Morrill. They never had the triplets but did have four children one of which died in infancy. The Millets moved to Boston and then New York. Frank worked on many more art projects during his life including the position of the director of Decorations of the World’s Fair in Chicago in 1892, he developed public works of art in Baltimore, Newark, NJ, and other cities. He also returned to work as a war correspondent in 1898 during the Spanish-American War. Frank also continued to travel Europe. In April 1912 he boarded the Titanic to return back to East Bridgewater where he was living again. With him he carried plans for a mural he created for the New Bedford Public Library. Frank Millet did not survive the sinking of the Titanic. The crew of the MacKay Bennett, a cable repair ship that was contracted to recover bodies left behind after the Titanic sinking, found his lifeless body. He was returned home and was laid to rest in Central Cemetery in East Bridgewater. His birth home still stands in Mattapoisett on the corner of Water and Cannon streets and is marked with a memorial plaque. During the late nineteenth and early twentieth centuries the Tri Town had its share of individuals living in seclusion in shacks along the water or in cabins in the woods. These “hermits” as they were as they were usually referred to were often the source of gossip by the local community. But they were also beloved and considered part of the community. In 1923, William Dexter lived in a small cabin on Randall Road, then known as the “lonely east section” of Mattapoisett. No one had set foot in the cabin since 1892 when William’s mother, Hulda passed away. William was different than some of the other local hermits because he was rumored to have had a large fortune. The gossip in the village at the time placed his value at about $25,000 to $50,000. William would not say how much money he had but he admitted to investing $10,000 in Liberty Bonds during World War I. He was also in the process of waiting for the estate of the late Mary Jane Randall to be settled in which she left him $12,000. His relationship to Mary Jane is not clear. However, she may have been a family relation as his mother’s maiden name was Randall. William was born in 1850 to Harvey and Hulda Randall Dexter. Harvey and Hulda married in April of 1848. This may have been Harvey’s second marriage. The 1850 US census lists three additional sons of Harvey; 21 year old Charles, 15 year old Andrew and 12 year old Fremon. Sometime between 1855 and 1860 Harvey passed away and Hulda worked as a seamstress to support William and herself. In September of 1864 Hulda married William Robinson Cushing, a local shipbuilder. At some point after his mother’s marriage to Cushing, William left home. He may have relocated to Taunton. Marriage records indicate that William was married in Taunton in 1876, twice. In August of that year he married Josephine Andrews Mortimer. And then in October he married Louise Ridlon. The circumstances of these marriages are not known. His wives may have died or there may have been other personal issues that led to the end of the marriages. By 1880 he returned home to his mother and lived with her and her husband. William worked as a marble cutter until the early 1900s. By 1910 he was self-employed working the odd jobs and living alone. Rumors of his wealth had spread and in 1923 he received a death threat. He received a letter marked with a skull and cross bones instructing him to leave $500 cash in a hole at the head of “a lane near Randall Road”. If he failed to do so the “Dread Visitor” would come to his house at midnight to kill him. The letter was signed the “Blinking Buzzards K.K.K.”. The Ku Klux Klan was experiencing a resurgence in the 1920s and was active in Worcester around this time. The name Blinking Buzzards is a little more mysterious. It may have been in reference to the 1921 Buster Keaton film, The High Sign. The film was a comedy in which Keaton played the role of a man that gets a job at a shooting gallery at an amusement park. He fools a gang known as the Blinking Buzzards into thinking he is an expert marksman. The gang hires him to kill a man named August Nicklenurser, “the town miser”, who was “tight as a fourteen collar on a sixteen neck”. In the film, Mr. Nicklenurser receives a letter from the Blinking Buzzards threatening to kill him if he did not give them money. The film ends in a comical chase through a house filled with secret passages. The reference to the Klan in the letter may have been added to sound more menacing but William was not taking any chances that things were going to end up like a hilarious silent film. Despite the letter warning him not to tell anyone about the threat, he reported the letter to the town. Several constables were dispatched to guard him. Though William kept his money in New Bedford banks, he had his cabin door secured with planks and his windows nailed shut and blinds drawn. It is not known how the events played out but it is unlikely that the villainous gang collected on its threat. William died three years later. He was laid to rest in Pine Island Cemetery in a grave he shares with his mother. In 1740, the death of the Holy Roman Emperor, Charles IV, set of the War of Austrian Succession. The War would have ripple effects felt around the world in Rochester. When Charles IV died his daughter, Maria Theresa was left to take his place. France and Prussia challenged her authority declaring she was not eligible to assume the various thrones held by the Hapsburgs because she was a woman. The British and Dutch who had long been enemies of the French supported Austria. Great Britain did not get involved in the war until late 1743. In March 1744, war was officially declared between France and Great Brittan. In May, the news reached the French colony at Nova Scotia. The French wasted little time in attacking British ports. The war soon spread to British holdings in New York, New Hampshire and Massachusetts. The war front in the American colonies is known as King George’s War. Native Americans were often drawn in to colonial wars as allies for the colonists. War could be a valuable source of income for natives but could also be devastating to native families because Native American men suffered high mortality rates in conflicts. Native Americans also sided with the French during colonial conflicts with the British. Eastern Abenaki in Maine often sided with the French but by the outbreak of King George’s War the Abenaki were suffering from internal conflicts and the southern Abenaki known as the Pigwacket sided with the British. However, not all of the Pigwacket wished to take sides and fight in the war. In July 1744, several Pigwacket leaders went to Boston to ask the Governor for a safe place to settle during the duration of the war. The Pigwacket wanted to locate to an area in which they had friends. The colonial government denied this request instead choosing a settlement where they could keep a close eye on and make sure they did not get involved in the war against the British. The other option given to the Pigwacket people was to return to where they came from and face a harsh treatment from both sides of the war parties. The Pigwacket were moved to Castle Island where they were put to work making snowshoes. A colonial committee had been charged with investigating the situation at Castle Island and decided to send the Pigwacket to “English Families, as shall be willing on reasonable Conditions to receive them…” The colonial government wanted to move the Pigwacket further away from the war front, ideally south of Boston. However, they had difficulty finding a town that would welcome them. By 1746, the Pigwacket found a home in Rochester. The people of Rochester were willing to host the war refugees and provided some land at Attansawomuck Neck now known as Mattapoisett Neck for the Pigwacket to live. Local residents Noah Sprague and Benjamin Hammond, Jr. were appointed by the colonial committee to act as guardians. These men provided the Pigwacket with necessary tools such as axes, hoes and a fishing boat with funds given by the committee. Noah Sprague sent bills to the committee to have them pay for materials and goods used by the Pigwacket people including wood cut from his swamp that was used to make baskets and dishes, cedar shingles and picked green apples. Sprague even charged the committee thirty pounds for “extradinary Travlle & care” he had provided. The Pigwacket people felt the reservation they had been placed on was too confining and they were not happy with their situation. A Rochester resident complained that the Pigwacket were “insolent and surly” and asked the General Court to remove them from Rochester. A General Court committee investigated the situation and accused local residents of selling liquor to the Pigwacket and providing poor guardianship. The Pigwacket stayed in Rochester but were moved to another tract of land northwest of the Witch Rock on New Bedford Road. By the early 1900s, this area of land had been “given up to woods and huckleberry pastures” and was known in Rochester as Pigwacket. In 1748 many of the Pigwacket left and returned home. However, some settled with Native Americans in Dartmouth, Freetown and Middleboro. The name Pigwacket survives today in Mattapoisett as Pigwacket Lane but the location of this street does not correspond with the location of the Pigwacket settlement over two centuries ago. In mid 1890s, a man lived on the shore of Mattapoisett in the village. He had built a small shack near the Bay View Hotel, now the present day Kinsale Inn. He often slept until noon and if disturbed before that he became very angry. He had very little in the way friends except for the many cats he fed and cared for. He referred to his cats as his “sole comfort” and preferred them to the company of “yaller dog flea incubators”. Henry Wilson Barstow was born in Rochester in the village of Mattapoisett on April 7, 1823. His parents were Calvin Barstow and Betsey Joselyn, who had married in Pembroke, Mass. before moving to Rochester. Henry had several brothers and sisters but by the time he moved in to his shack it seemed he had little or no connection with them. Instead, he fondly recalled friends from his past with names such as Southworth, Sprague, Delano and Hathaway and mournfully commented “I suppose [they] are dead. We used to have mighty good times… just like brothers together”. Growing up in a shipbuilding village led Henry to a career as a ship joiner. He most likely learned carpentry from his father who was also a ship joiner. Henry claimed he traveled New England looking for work and found his first job at Foster’s Shipyard in Medford where he worked for four years. By 1850 he returned home and lived with his parents and three of his brothers. In June 1863 Henry registered for the draft but records do not indicate that he served during the war. Wanting to contribute to the war effort, Henry made a trip to Charlestown where he said battleships were being built for war service. However, many others were looking for work building the ships and he was put on an employment waiting list. When he asked the superintendent of the yard how long the wait for a job would be, the superintended produced a waiting list that was four feet long. “There are a half a thousand ahead of you and you will have to wait your turn”, he was told. Over thirty years later Henry, recalling the incident explained, “I concluded to wait, and I’m waiting yet”. By 1870 Henry was still living with his aging parents. Three years later Henry’s father died. In 1878 he would lose his mother too. By 1880 Henry was living as a boarder in the home of Sarah Baker. He soon decided he wanted to spend the rest of his life alone. In 1887 he built his waterfront shack, which he made from a discarded shipbuilding steam box. He included an old “cook stove” and a wood bed. He decorated his home with lithographs, a life insurance calendar, and hung a plaid horse blanket over the door way which he referred to as his “port-hooray”. Henry could often be seen emerging from his shack smoking a corncob pipe protruding from his bushy white beard followed by his large number of cats. He supported himself in his later years by fishing and sawing wood for people in the village. He enjoyed eel spearing and would take a small row boat out off the shore to spear them. He described eating eel as better than beefsteak and without “bones to stick in your throat to choke ye, like there is in shad”. I think I heard a bullfrog cough. The moon rose up beyond the sea. And shone down on the wharf and me. Henry never married leading villagers to speculate he suffered from a broken heart. When asked about love he once said, “love is serious business and the path of matrimony is one of thorns”. As Henry grew older he had more difficulty caring for himself. Despite living on the waterfront in a shack he complained that with the “bitter cold days I can hardly get enough [food from fishing] for myself. Cold weather don’t agree with me”. He eventually moved indoors to the almshouse on Aucoot Road where he began to suffer from the effects of arteriosclerosis. It was there on May 30, 1910 that Henry Wallis Barstow passed away at age 87. He was buried the next day at Cushing Cemetery. Henry Barstow’s grave stone suggests that someone took care that he didn’t end up in a pauper’s grave. After the Civil War, Marion began to develop in to a summer vacation spot. The railroads connected Marion to Boston and Fall River making the region more accessible in the pre-automobile age. Writers, artists, musicians and anyone else who could afford to spend a summer out of the city could take the Fall River steamboat from New York to Fall River and then hop a train to the sleepy summertime resort in just about a day. Such a trip aroused Marion in August 1887. During 1887, construction on the Eiffel Tower would begin, the United States leased Pearl Harbor as a naval base, Gottlieb Daimler unveiled his first automobile, Buffalo Bill’s Wild West Show opened and President Grover Cleveland was gearing up for a re-election run. He had a busy first term. He created the Interstate Commerce Commission, which was to regulate the railroads and later other “common carriers” such as trucking and telephone companies. This agency would last until 1995. He was well known for the use of his veto pen, vetoing more bills than any president up to that time including bills providing relief for Civil War veterans and drought stricken farmers in Texas. At the beginning of his first term, the President was also a bachelor, but he would soon marry. His bride to be was Frances Folsom, a 21-year-old graduate of Wells College. Frances was the daughter of President Cleveland’s law partner Oscar Folsom. When Frances was 11, her father was thrown from his carriage and killed coming home from a meeting. Cleveland was appointed her legal guardian (laws at the time did not recognize her mother as her legal guardian). In 1886, at the age of 49, President Cleveland married his 21-year-old bride. They had a small ceremony in the White House attended by relatives and close friends. Soon, the new First Lady would gain the attention of many and was followed closely by the newspapers. In 1887, Mrs. Cleveland was invited by the Arctic explorer, Adolphus Greely along with other guests to his summer rental in Marion. Word quickly spread that the first lady was in town. The newspapers wrote extensively on what Mrs. Cleveland wore and followed her movements from church to lectures to lunches. Despite a rainy, gloomy first day in Marion, the First Lady was impressed with all Marion had to offer and decided to return the next summer for vacation. Before she left for the season, she announced that she would receive visitors at the Greely’s. Word spread and on the day of the reception visitors lined the street for a chance to meet the first lady. However, not everyone had to wait in line to meet her. Mrs. Cleveland took a trip to Mattapoisett to meet 98-year-old Keziah Randall who had recently applied for a government pension. Mrs. Randall’s husband had served during the War of 1812. When Mrs. Randall received the pension, it was noted that Mrs. Cleveland helped secure the pension after her visit. The Cleveland’s spent their next four summers in Marion. The President spent his time preparing for his re election… by fishing. He fished regardless of weather and upset the local fish sellers when he gave his catches away for free. His favorite fishing spot became known as Cleveland’s Ledge. The Cleveland’s rented houses at 192 Front Street and 46 Water Street during their stays at Marion. The President loved the house on Water Street so much he wanted to purchase it, but the owner did not want to part with it. He offered to sell it at an inflated price, but the President turned him down. In 1893, Frances Cleveland’s prediction that she would return to the White House with her husband came true and the visits to Marion came to an end. In 1895, when their third child was born, they named her Marion.